Many aspiring homeowners can’t afford the upfront costs associated with purchasing a home, it can be a financially daunting task. Luckily there are different options available on the market such as rent to purchase. In real estate law, there is an agreement known as rent to purchase (rent-to-own) agreements. It is an agreement between the homeowner and tenant, which will give the tenant the option to buy the property that they are renting. While rent to purchase may not be for everyone, it does provide people with the option of one day owning the home that they are currently renting. 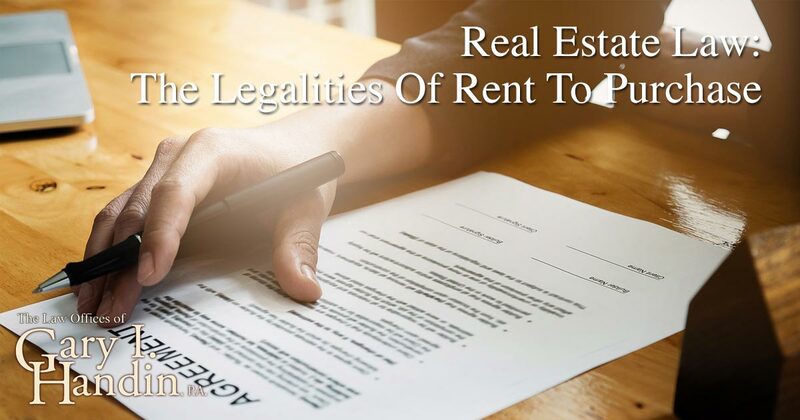 In order to rent to purchase a home, you will need the help of a real estate law firm to ensure that both parties (landlord and tenant) are satisfied with the terms of the agreement and the outcome. What Does a Rent to Purchase Agreement Consist of? While a normal lease will have only one contract between the tenant and landlord, when it comes to rent to purchase there will be two contracts between the tenants and the landlord. The first would be the standard lease agreement and the second would include an agreement with the option to purchase the property. This is the standard contract between a tenant and landlord. The title of the home remains in the landlord’s name until the tenant decides that they would like to purchase the property. The lease agreement will contain all of the regular components such as the lease period, rental due as well as responsibilities that both the tenant and landlord have to the property (such as repairs and general maintenance). This is a document that the tenant can sign if they are interested in purchasing the property while they are still renting from the landlord. It gives the tenant the right to buy the property within a specified period of time for a particular price. The tenant is able to either pay the landlord an upfront fee (option Money) while leasing or pay higher than normal rental rates, some or all of which may go towards the purchase price of the property. For example – if the rental market value on a property is normally $3000 a month, the tenant may instead pay $5000 a month. The extra $2000 will go towards the purchase of the house. If the tenant does not sign the option to purchase contract, they are not liable to pay an extra fee or extra on their monthly rental. How Does Rent to Purchase Differ From a Normal Lease Agreement? Aside from the fact that the tenant is now given the option to purchase the home within a specified period of time, there are other obligatory differences that affect both the landlord and the tenant. As mentioned in the example above, the rental amount can be higher than the current market value, simply because that extra money is being put towards the purchase of the house. This does depend on the clauses in the contract, but generally in a normal lease agreement the landlord is responsible for maintenance and repairs. In the case of a rent-to-purchase agreement, the responsibility for maintenance and repairs fall on the tenant. Until the property is paid for, the title to the property will remain with the current landlord. This means that the tenant must ensure that they comply with the restrictions and clauses within the regular lease agreement. A violation of the lease agreement means that you as the tenant will forfeit your option to purchase among other things depending on the contents of the lease agreement contract. Make sure that your real estate attorney takes a look at the documentation prior to you signing anything. You may intend to purchase the property, but if there is any miscommunication with your landlord you may end up paying extra and forfeiting your money. Why is a Real Estate Lawyer Important in Rent to Purchase Transactions? A real estate lawyer is a necessity in rent to purchase transactions between a landlord and tenant, as the contract needs to cover all the terms and conditions suited to both parties. The contract will include things such as the period of time in which you as the tenant have to purchase the home as well as the fixed price of the property. The expert attorney and experienced team at Gary I. Handin, P.A. will ensure that you have peace of mind as you begin your journey to purchasing your first home. For more information on rent to purchase agreements, give us a call at 1-877-815-4560.